Manila Philippines Photos, just a quick glimpse of what you might expect. It is always difficult to get an idea of a city, particularly one the size of Manila. I have taken some Manila Philippines Photos of the general area rather than attractions. 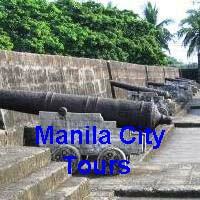 You can have a look here for photo galleries on attraction in Manila and elsewhere. The photos do not do the city any justice, as most photos are fairly one dimentional, but they will at least give you a starting point on what to expect. Enjoy and stay tuned for further galleries. In the foreground of the photo is a traditional banca or boat, which you will see plying the waterways throughout the 7,107 islands of the Philippines. 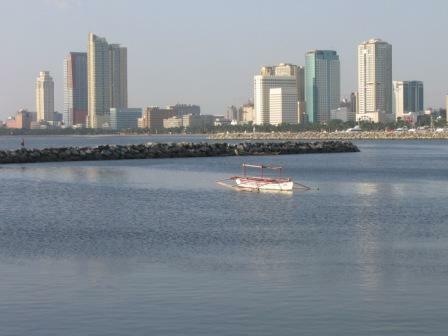 In the background, built up to the edge of Manila Bay is the modern world, Manila City, with skyscrapers reaching out and touching the skyline. This photo gives a good contrast of Manila Philippines Photos. Looking through the trees in the park, on a quiet day, searching beyond the walkway for the yachts moored in Manila Bay Yacht Club. Fronting Roxas Boulevard is the Cultural Center of the Philippines. 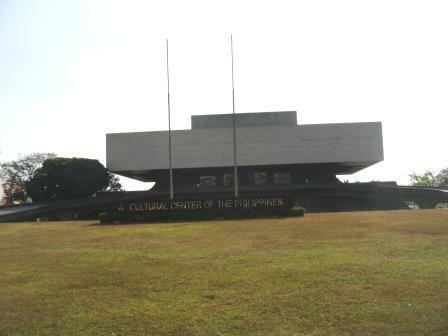 It was designed and built in 1969 and is the center of Filipino artistic achievement. It was designed to promote Filipino arts and culture. It was looking a bit tired and run down when I visited, but they were advertising a number of upcoming exhibitions. 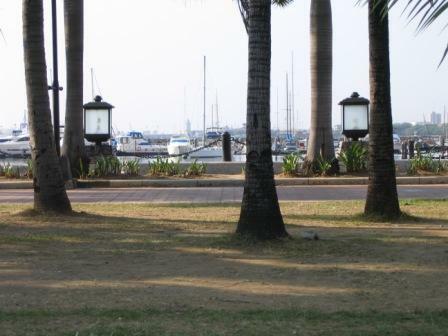 The Manila Yacht Club faces Roxas Boulevard and is the start of the well known Manila Baywalk. This club is a members only elite club, don't expect to gain admission to the dining area unless you are a guest of a member. Once again you have luxury next door to the poor. To the right of this picture you can see the Manila Bay Yacht Club with the boat moorings within the breakwater. 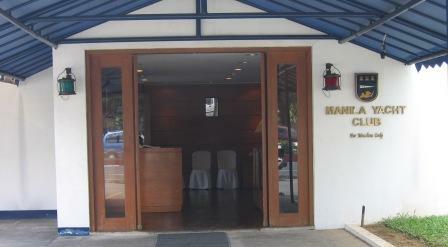 To the left of the photo is the entrance past the Cultural Center of the Philippines. The intersection you can see there is the corner of Roxas Boulevard and Pedro Bukaneg. In the distance is Manila Bay, quietly waiting for the sun to set. 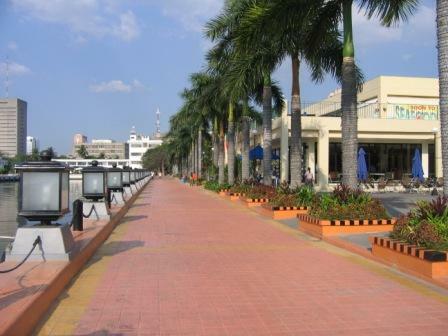 To the side of the Cultural Center of the Philippines bordering the Manila Bay Yacht Club is a nice walkway. It has been recently upgraded with some upmarket shops and restaurants, the development is called Harbour Square. Behind where I have taken the photo is the ferry terminal for ferries to Orion on Bataan, Corregidor Island and also Manila Sunset Cruises. One of the most well known roads in Manila or even the Philippines for that matter is Roxas Boulevard. 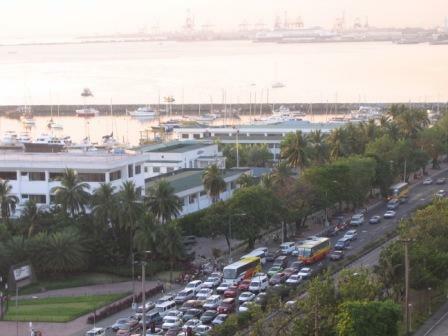 Look out in peek hour, because Roxas Boulevard is not a place you want to be, traffic is unbelievable! This photo was taken on the weekend so the traffic is not so daunting. The road is five lanes wide going in both directions, but it is not uncommon to see more than five vehicles abreast. Lane markers are not really adhered to....oh and do not, I repeat do not, walk out on to a zebra or pedestrian crossing, the traffic will not stop, be careful even if the lights say walk, because the cars will not always stop! 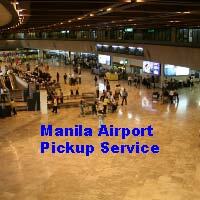 Have a look here for information on Manila and what Manila has to offer.